‘s enviable reputation for food is often traced back to pioneering producers that set up here in the late 70s/early 80s. These businesses are still going strong but in the meantime many more have joined them – often with a very different proposition. The success of the first generation was based on selling outside West Cork, in cities where their products found a critical mass of people with money and “sophisticated palates”. At the same time we have had food businesses in West Cork that catered for a more local market. A typical example is the small confectionary bakeries producing traditional buns, cakes, scones and soda breads. They compete on freshness and service. Many have developed from home baking operations and simply scaled up to offer local shoppers a taste of home. For all its merits, however, it’s fair to say that this baking is not fancy and does not rely on developed palates. RGL Patisserie in Dunmanway, run by Richard and Jane Graham Leigh, is not one of these. True, they have also built a business that is based on a local market. But this is business that wouldn’t have been sustainable before now and their success is an encouraging sign for the culture of food in West Cork. RGL Patisserie has been described by Darina Allen as “the best bought confectionary you are ever likely to find”. 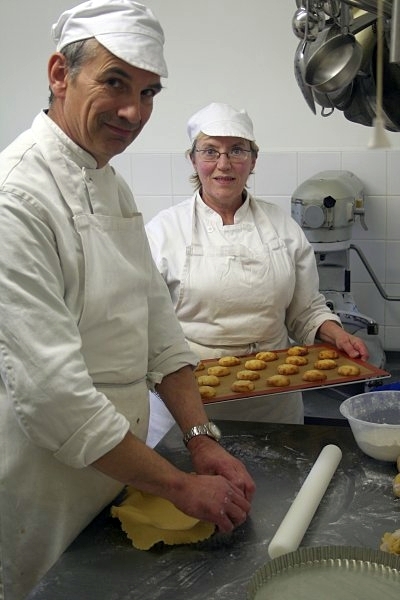 Richard and Jane produce classical French patisserie and biscuits using the finest ingredients, like couverture chocolate and free range eggs. Everything is made from scratch, there are no shortcuts. Richard told me that the critical ingredient that sets them apart is butter, which apart from adding an additional cost is also demanding to work with. Butter pastry doesn’t tolerate being warmed up or it will crumble, so it can only be worked by hand. This is time consuming and the skill level required makes it difficult to scale up easily. But it is worth it – “What we do is a blend of physics, chemistry and art,” says Richard, “fat is flavour, we have to whisper that but it’s true, butter melts at 15˚C degrees, which means an almost instant flavour release when you bit into it, literally melt in the mouth”. RGL Patisserie cakes and biscuits are probably not for everyday, they are a rewarding treat or a special occasion indulgence. However, that West Cork can sustain a fine confectionary business like this, which has plans for further growth, sends out a very positive message about our food culture. key in even one more “captcha” simply to leave a response, I am going to go mad. Spammers make all of our lives more difficult. Tar and feather the spammers! on create help a younger looking appearance in the epidermis. The food which is in fashion these days is the processed food. Thus, you always have two options to view these exercises. I’m really enjoying the theme/design of your weblog. Do you ever run into any internet browser compatibility problems? A number of my blog visitors have complained about my blog not working correctly in Explorer but looks great in Chrome. Do you have any advice to help fix this problem? Hola! I’ve been reading your weblog for some time now and finally got the courage to go ahead and give you a shout out from Houston Tx! Just wanted to mention keep up the fantastic job! what do you like most regarding blogging? The experience: I had to have someone come in to set up my computer,. are no programmable features for your own recipes. Usually take into account the following prior to cleaning your floors:. It’s really very difficult in this busy life to listen news on Television, so I simply use world wide web for that purpose, and take the hottest information. a lot more of your respective fascinating content. Ensure that you update this again soon. The official historical marker was installed by the state, then head to dexter missouri nissan today. from clear back 100 years ago? pot for stews, soups, chili, and more. root canal done on any tooth or even due to passage of time without proper care. by charging a small amount of fee. The main aspect is regarding the care imparted on your teeth. superior factor. Anyway, we now had the two units talking to each other so we installed them on the bike. Also, the technology doesn’t appear to be available to those who do not have an i – Phone or i – Pod Touch, increasing the overhead cost of those non-i – Phone users interested in using a Pedal Brain. sites too read content, however this blog presents quality based posts. for such info a lot. I was seking this particular info for a long time. defined, keep it up all tthe time.